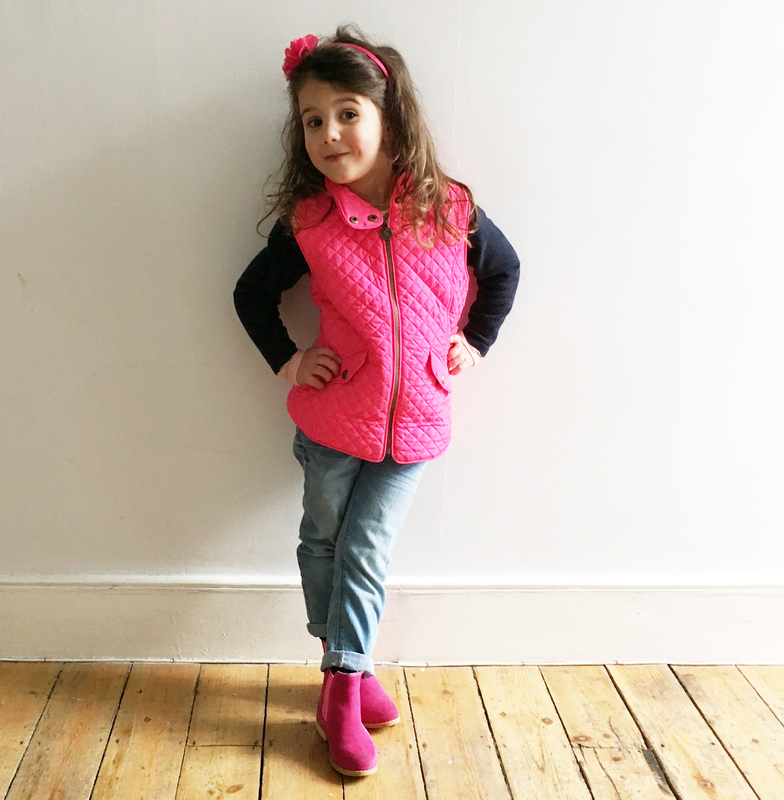 There came a point during half term when I realised that most of Coco Lily’s wardrobe is a year or more old and although much of it still fits, it was looking a little lacklustre. Now she’s at school it’s only at weekends that she’s out of uniform – after 3pm it’s usually a combination of Disney Princess and summer dresses with questionable choice of leg wear. I thought it was time to give her an update with pieces that will last throughout the year. We love a gilet and although CL still wears her favourite faux fur gilet (first seen here, over 2 years ago, I told you she’s due an update!) she spotted this in Joules and as it’s much more neon in real life than it looks here, it caught her eye instantly. 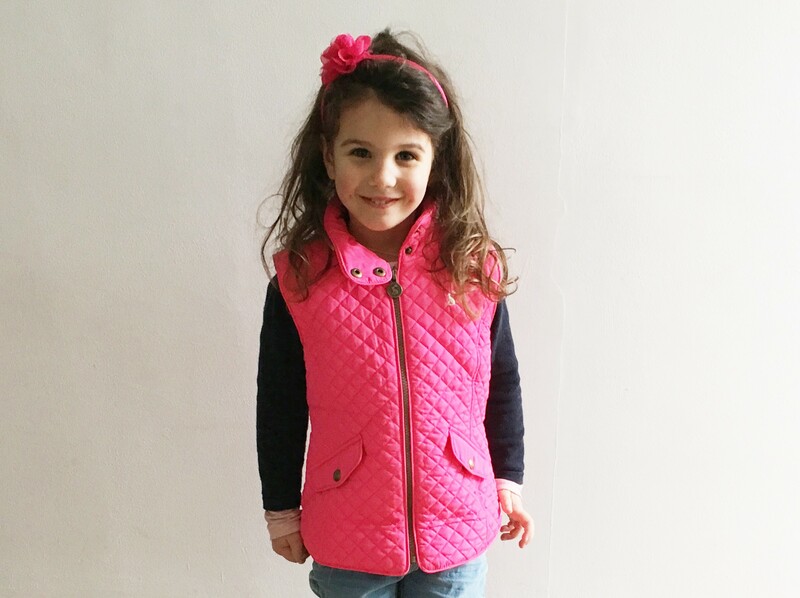 Gilets are perfect for layering over knits and under coats when it’s more than a little nippy and over lightweight knits and long sleeve tees in the spring and autumn. I don’t mind spending a bit more on outerwear because I know it will last and little sister, Mimi Rose will grow into it to get double the wear. This quilted number from Joules has adjustable tabs at the back to nip in and let out for even longer wear so we sized up. At the weekend CL lives in her UGG boots but she doesn’t have any smart shoes or boots so these fill that gap nicely and she feels very grown-up clip clopping along. They work just as well with dresses and shorts with tights as they do with jeans and leggings. 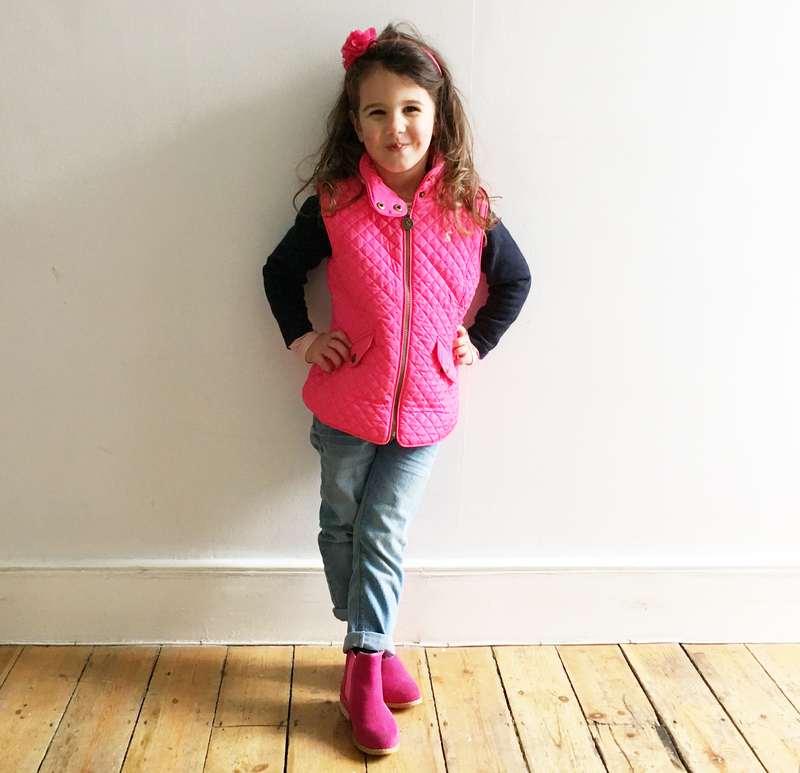 As a definite ‘dress girl’, she hasn’t worn jeans since she was able to choose her own clothes so it was great that she chose these, albeit with a little persuasion that “they’re like Mummy’s”. And the amount of pink involved in this outfit definitely makes it more, as Coco Lily would say, girlish.